BCHA and Bob Marshall Wilderness Outfitters in Montana are excited to announce Madeline Baker of Post Falls, Idaho as the recipient of this year’s scholarship. Madeline was selected from a field of 30 excellent applicants. While it was challenging for the Education Committee of the BCHA to narrow down the applicants, Madeline demonstrated the interest and dedication that BCHA was looking for. The 5 day horse and mule packing class includes a “hands on” Pack Trip into the Bob Marshall Wilderness that starts on June 11, 2016. 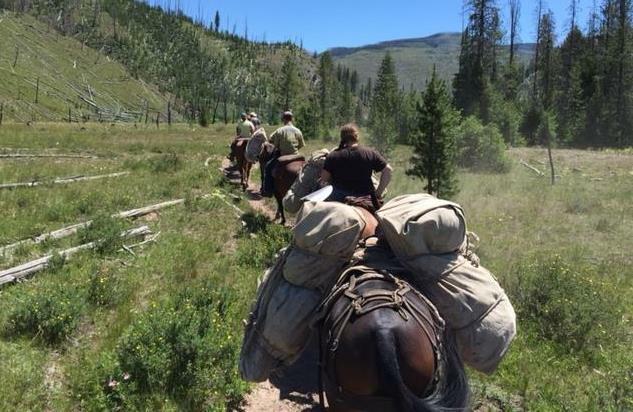 The class of 10 students will spend the first day learning the basics and will then practice those skills over the 5 day period while traveling by horse and pack string in the 1.5 million acre Bob Marshall Wilderness. Each student will earn a Leave No Trace certificate as well as learning wilderness skills such as camping, cooking, care of livestock and how to be a good wilderness steward. Below is the Essay of no more than 250 words that Madeline submitted. As a three year member of the Panhandle Back Country Horsemen, I have developed a passion for our spectacular public lands. Being able to preserve the lands while on horseback has further fostered my appreciation of the talented steeds we ride. Packing has been of interest to me since I joined our Panhandle chapter and watched the careful thought and planning it takes. I want to learn how to pack so I can take my horses on overnight trips and safely carry supplies when I ride with the PBCH group. Horses take my breath away. I have personally experienced their grace, strength, personality, heart, versatility, intelligence, and sensitivity shine through in western pleasure shows, o-mok-sees, and on the trail. Being a primary caretaker of our family’s horses has given me a strong work ethic. When I joined the PBCH and started to branch out in terms of trail ride locations, I was blown away by God’s creation and by the wisdom in our chapter’s members. My passion and appreciation for the outdoors continues to grow. Being surrounded by nature is a testament to the glory of God for me. If given the privilege to participate in this packing trip, I will use my knowledge to better assist the PBCH outing and work parties, and will be a safer, more thoughtful rider. I plan to share the knowledge I will gain with others, including our local 4th graders during their Idaho History Rendezvous, to promote safety and knowledge on the trail. A 2nd class of 10 students that was sponsored by individual State BCH Organizations will start on June 26, 2016 and will have 2 Montana BCH scholarship winners, David Sanchez of Darby, MT and Sara Sylte from Helena, MT, who will be in attendance. In addition the Michigan BCH sponsored a Scholarship winner, Jordyn Hausler, who will be attending the Packing and Wilderness Skills class. Congratulations to all of the attendees. BCHA and Bob Marshall Wilderness Outfitters are honored to help educate our next generation of horse, mule and wilderness users.